"I've wasted my life." 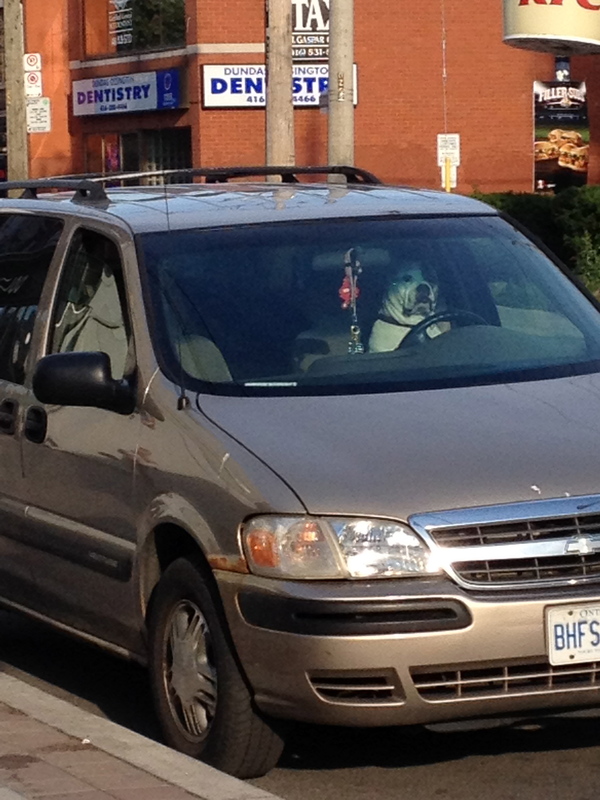 Caption and photo of a dog waiting in a parked car above by Claudia Calabro. You can learn a lot about a city’s priorities when you sit in a parked car. I recently spent a work day doing just that—first on a downtown street, then a pleasant residential road, and finally, two store parking lots. I wanted to figure out why city councillors routinely champion the cause of parked cars over the safety of pedestrians and cyclists. I start my parking day during rush hour on Bloor Street. After 8 a.m., and until 9 p.m., I have to pay $3 per hour for the average 130 square foot (12 square metre) parking space. 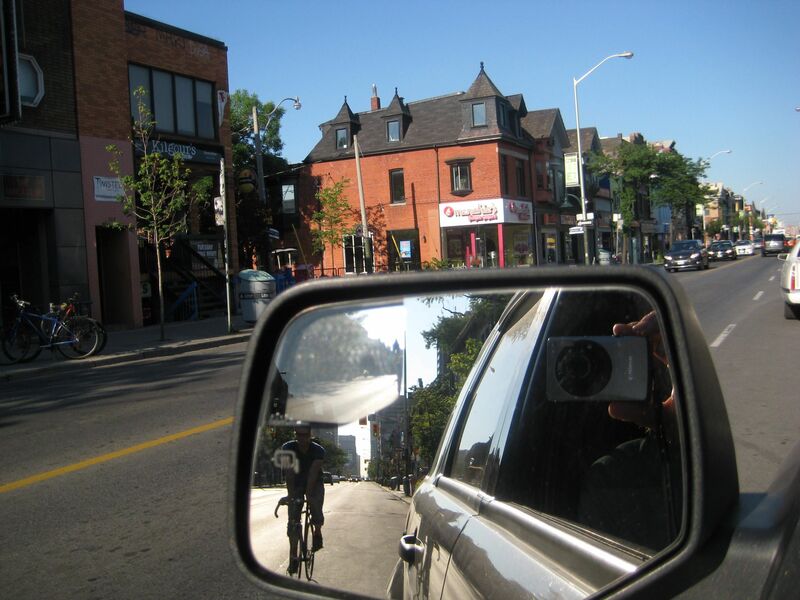 I carefully open the door to avoid hitting cyclists skirting past my rearview mirror. In theory, I’m supporting local businesses even though many won’t open until 10 a.m. I might actually be visiting a friend living nearby—or listening to the car radio. 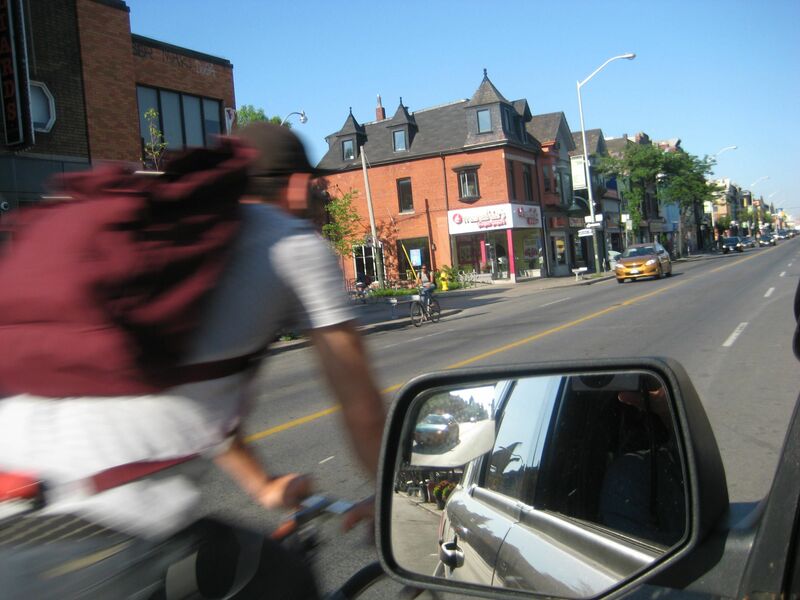 Many merchants and their council champions believe that less on-street parking equals less business despite the lack of evidence supporting this view, according to a recent report by the Toronto Centre for Active Transportation (TCAT). Shoppers, not parking spots, help businesses thrive. Three TCAT studies for Bloor-Danforth found that pedestrians, cyclists and transit users comprised 80-90% of business for merchants. The TCAT surveys also found that the biggest proportion of patrons in each study area support bike lanes or wider sidewalks. In the Annex, where I’m parked, cyclists spend as much as motorists—but cyclists have first claim only to the curbside potholes, unless blocked by a parked car. By lunchtime, I tire of taking up space on Bloor. I find a cheaper venue a mere 200 metres away on a tree-lined residential street. Parking is free from 10 a.m. until midnight, with no time limit. The city’s generosity is again driven by the economic activity I generate, but no one disturbs me to confirm the theory. I reflect on the odd model of competition: if I park on city property on Bloor or a nearby parking lot, I pay a fee. If I move to a side street, City Hall gives me the space for free. How many free parking spots are there on the first block of each side street running north and south from Bloor? We recently counted over 650 such spots in the 15 block area west of Spadina Avenue alone. Today, it’s easy to find a parking spot on this street. But when residents return home there will be more “cruising” for parking—creating extra pollution, congestion and danger for kids. Professor Donald Shoup in The High Cost of Free Parking found that motorists in the Westwood Village of UCLA each travelled about one kilometre to find a free spot. Over a year this amounted to 1.6 million km of extra driving. Later in the afternoon I conscript a neighbour to drive me to a few stores, leaving the other car to rest in the shade. In truth, I don’t own a car (and I can’t even find my driver’s license) but I do have cooperative neighbours. We visit a few stores where parking is “free”… at least for the car. A spot in a parking lot takes up 330 sq. ft. (31 sq. m), given the necessity of access lanes. Other shoppers, including cyclists and pedestrians, pay for (i.e. subsidize) this parking in the price of their groceries. According to Prof. Shoup there are eight parking spots for each car in the U.S. (e.g. at home, the mall and work). The figure is likely a bit lower in Canada. Residents on my street who don’t have their own parking spot can get one on the street for 48 cents per day. This might explain why a car with a flat has been parked down the road for over a month. The $14.25 per month price is great value for 130 sq. ft. of real estate. Parking in Toronto is affordable. Housing for people…not so much. So how might a city with different priorities act? First, replace main street parking spots with bike lanes or wider sidewalks to protect residents traveling or wanting to travel by bike or on foot. Parking revenues might fall, but so would health care costs from bad air, physical inactivity and injuries. Secondly, charge visitors for daytime parking on side streets. Priced parking encourages people to leave their car at home, thereby freeing up more space for walking, cycling and a greener streetscape. Return this revenue, as recommended by Prof. Shoup, to the local neighbourhood for improvement projects. Finally, recognize that a shopper arriving on foot, bike or transit has just as much value as a shopper in a car, but takes up far less room. For a long time our city has valued parking spots over the interests of other users. A fairer, safer and more beautiful streetscape is possible. Albert Koehl is an environmental lawyer and founder of Bells on Bloor. He was a member of the Ontario Chief Coroner’s 2012 review of pedestrian deaths. He is a candidate in Ward 20, Trinity Spadina.